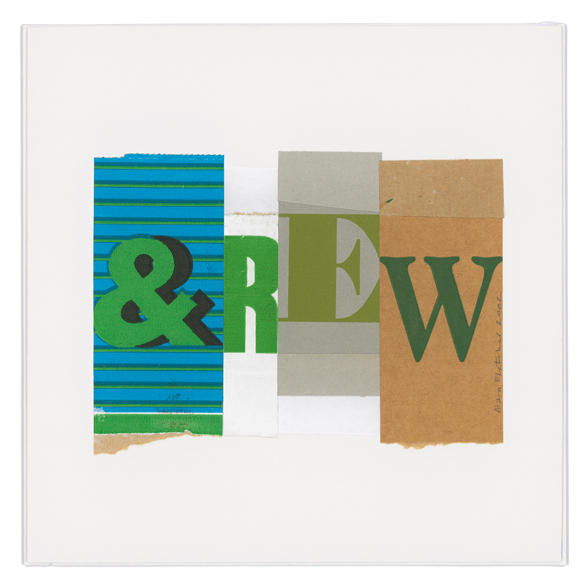 Fletcher used typographic collages to explore the visual correspondence between words and pictures. While some of his images demonstrate exactly what they state – such as a collage that tells you it’s a collage – others demonstrate the very opposite – the word grey, for example, rendered in rainbow hues. Fletcher devoted a plan chest draw to found letters, which he kept in plastic bags sorted into ‘a’s, ‘b’s, ‘c’s and so on. Taken from all sorts of printed sources – from Italian newspapers, Spanish magazines, Portobello market cardboard boxes – they amount to a record of Fletcher’s life and travels.